Coalwood, West Virginia, 1957. Working in the coal mines is an inescapable way of life in this small town. 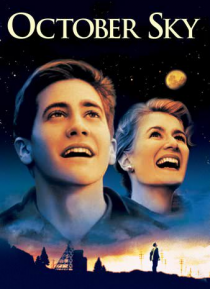 When high schooler Homer Hickam, Jr. (Jake Gyllenhaal) sees the Sputnik satellite in the night sky, he dares to break free of the mines and reach for the stars. With the support of his teacher (Laura Dern) and three friends, Homer sets out on an inspiring quest to build his own rocket. Overco… ming a poor education, a tough father (Chris Cooper) and a series of misfires, Homer turns his dreams into reality in this incredible true story of hope, determination and triumph. "You'll laugh with it, cry with it, and go away absolutely loving it," says Robert Butler (Knight Ridder News Service) of the critically acclaimed OCTOBER SKY.